This week's Creative Late Bloomer is advertising exec-turned-writer Ilene Beckerman. She was 60 when she stumbled into her writing career. She now has five books out, including the New York Times bestseller Love, Loss, and What I Wore, which was adapted into an award-winning play by Nora and Delia Ephron. 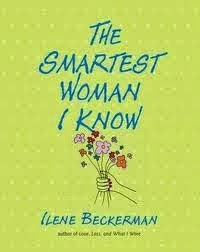 Beckerman's fifth illustrated book, The Smartest Woman I Know, a tribute to her grandmother Ettie, was published in 2011 by Algonquin Books. In February, 2013, Beckerman was part of the seven-member cast of the Chester Theatre Group's production of Love Loss And What I Wore at the Black River Playhouse in Chester, New Jersey. The play is Nora and Delia Ephron's adaptation of Beckerman's bestselling book of the same name. In April, 2013 Beckerman was the keynote speaker at the Adath Israel Women's League Spring Brunch in Laurenceville, New Jersey: "After raising five kids, I feel like I'm just getting started. Ladies, go for it...don't give up. Your time is now!" "When I was 60 years old, I wrote a memoir about my life before I had children. I have 5 children. They didn't think I had a life before I was their mother. Sometimes even I wondered. When I was 62, my second book was published. It's called What We Do For Love. I had been looking for Prince Charming but I never found him. Cinderella did. My third book was published when I was 65. It's called Mother of the Bride: The Dream, The Reality, The Search for a Perfect Dress. Childbirth is a lot easier than being mother of the bride. At 70, my fourth book, Makeovers at the Beauty Counter of Happiness was published. I'm still looking for the perfect mascara. I didn't write another book for a few years. I cleaned my closets. When I was 75, my book The Smartest Woman I Know was published. It's not about me." "I was always doodling or writing teenage poems. Didn't everybody write teenage love poems? I thought I was Dorothy Parker. What happened with this book, which was never to be a book, was I couldn't sleep one night. There was nothing on TV and there was nothing to read. And I thought of a dress my mother had made me...I just loved looking at this dress. And I thought, could I think of another dress that my mother made? So I started thinking of these dresses and they just came back, like that. I thought I'm going to draw them. I don't draw but I doodle. When you get past 60, 65, if you don't write something down it's gone. So I just doodled them and the next day I was so happy. I had a big smile on my face because I remembered the rick rack. I remembered going to Macy's because in those days Macy's had a whole floor of fabrics because women sewed. I drew them and I looked at them and I thought, this tells the story of my life... so I put some words to them. I went to Staples and I made copies and gave (them to) my three daughters who thought, that's cute. It's another thing from Mommy that she made. Maybe someday she'll buy us a Hallmark card instead of making us a birthday card. And I gave copies to my two sons (who had no idea what this thing was) and to my two best friends and to my sister. And that's it. Another little project. A year later my friend called me up and said, this woman wants to publish your book. She's going to call you. Be nice to her. I thought, oh, come on. First of all, book? I didn't have a book. Why would anybody want to publish this thing? I was a 60-year-old grandmother from New Jersey. I hadn't done anything. I hadn't saved the rain forest. I hadn't been groped by a politician. There was nothing, nothing unique about me. I'm the one in back of you at the A & P. And this woman called me up. And the book got published." ON CREATIVE LATE BLOOMERS: "Sometimes I feel like Grandma Moses -- she didn't start until later in life either -- but I try not to look like her."